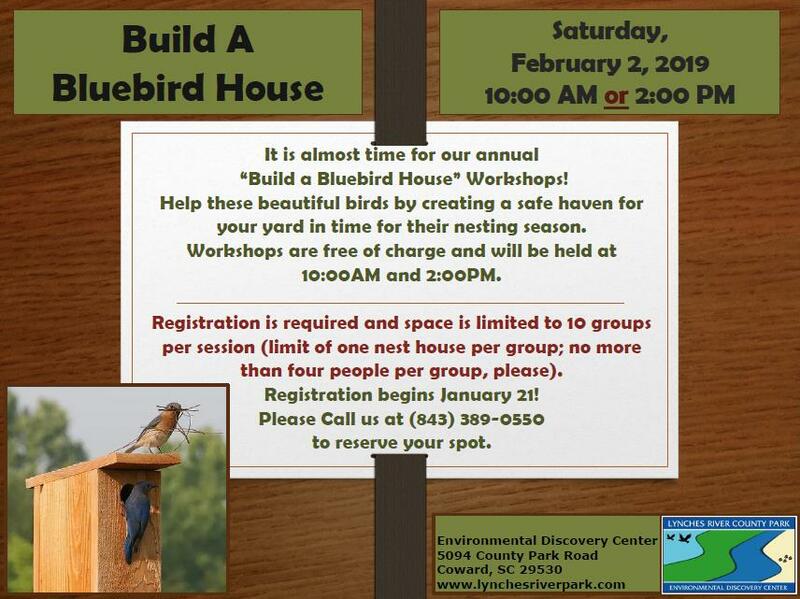 Build a Bluebird Box Saturday, February 2, 2019 10:00 AM & 2:00 PM Join us for this FREE annual First Saturday Program. February is the time to start preparing for Eastern Bluebird nesting season. Help sustain these beautiful, at-risk creatures by placing a nesting box at the edge of your yard. Each attending group will construct one nesting box for Eastern Bluebirds, with materials provided. Group or Family size is limited to four people. Two sessions are offered, morning or afternoon. Space is limited, therefore registration is required. Call (843) 389-0550 to register!